A galette is a traditional French dessert that might be the inspiration for the All American Pie. It is a fruit filled dessert that has the crust wrapped around and pinched together in a rustic fashion. I think it’s a great alternative to a traditional pie because you cut the amount of crust (and thus butter, fat, and carbs) in half. Making the crust with whole wheat flour emphasizes the health benefits of a galette and enhances a rustic texture. It’s also a little thinner than a pie and makes a lighter dessert for summer. A galette is good all throughout the year, and these summer fruit options can be substituted for apples in the fall, strawberries in the spring, and even tomatoes and cheese for a savory option. It can be made ahead and served chilled or at room temperature, sliced warm out of the oven and served a la mode, or Ryan’s method, which is cut up and hand-held for dessert and then breakfast the next morning. To make the dough, use a mixer to combine the flours, salt, and cinnamon. On low speed, add the butter and mix until it starts to incorporate. You don’t want to mix too quickly or too much, or the butter will melt and ruin the consistency of the dough. When the dough starts to look like wet sand, add the 2 tbs ice water and mix until it just starts to form a ball. You might need an additional tbs of ice water, but only use if necessary. Remove the dough from the mixer onto a lightly floured surface. Lightly pat and shape into a thick disk, wrap in saran wrap, and refrigerate for at least 1 hour, up to overnight. About 20 minutes before the dough comes out of the refrigerator, preheat the oven to 350 degrees. Prepare the filling. To make the filling, combine all of the ingredients in a large bowl and make sure everything is well combined. Let the fruit macerate for 20 minutes. Remove the dough from the refrigerator onto a lightly floured surface. Use a rolling pin to gently roll into roughly a 12 inch diameter circle. Move the dough onto a lightly floured cookie sheet, centering as best you can. 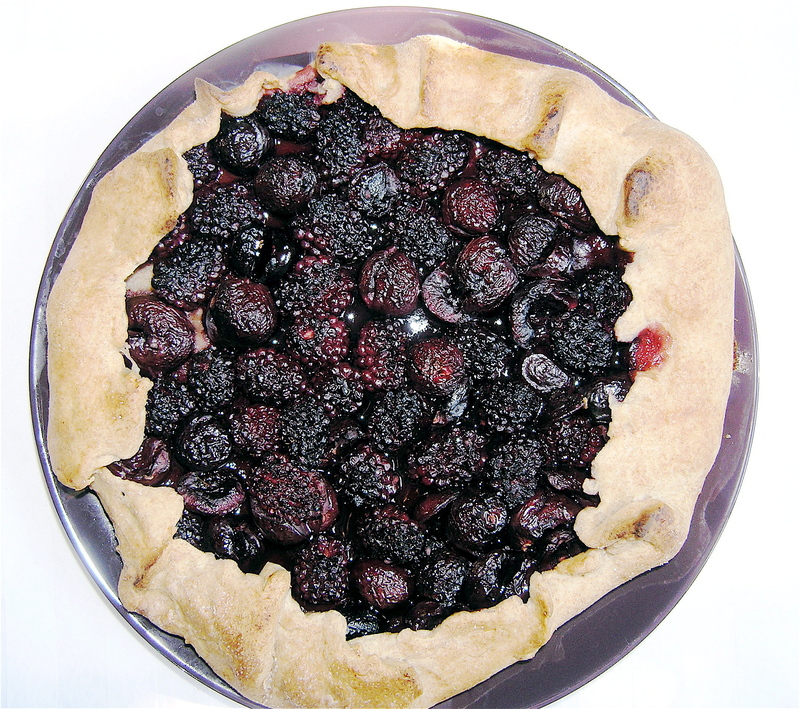 Spread the fruit evenly onto the crust leaving a 1 1/2 – 2 inch border. Using your hands, fold a 2 inch segment of the crust up around the edge of the filling. Continue by grabbing the next segment next to it and folding up as well. Pinch the folds together and continue around the crust until the whole thing is pinched together. It doesn’t have to be perfect, it’s supposed to be rustic after all! Use a pastry brush to brush the milk around the crust which prevents browning. Bake for 50- 60 minutes or until the crust is golden brown and the fruit begins to bubble. Remove from the oven onto a wooden cutting board to cut warm or remove and cool completely if you wish to serve at room temperature. Cut as you would a pizza.